North Tahoe players celebrate a point during the Lakers' home tournament this past weekend. The Lakers begin Northern Division III play with a rival match at Incline on Thursday at 5 p.m. North Tahoe returns home to host Silver Stage on Tuesday, Sept. 15. 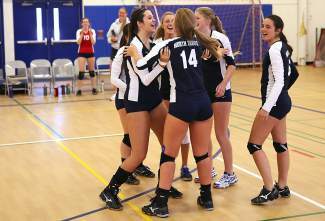 The season looks bright for the North Tahoe volleyball team. Competing with a veteran team made up of six seniors and one junior, the Lakers went 5-1 over the past week and played into the semifinal match of their season-opening tournament on Saturday. North Tahoe defeated visiting Coleville and Sierra Lutheran in straight sets in nonleague matches Tuesday and Thursday — setting down Coleville 25-16, 25-13, 25-22, and Sierra Lutheran 25-5, 25-11, 25-12. The Lakers then opened their tournament with wins over Quincy, 2-1, Whittell, 2-0, and Elko, 2-1. Elko, a school of over 1,000 students, is a regular top contender in the Division I-A. The hosts finally lost in the semifinal, 2-1, to Antelope (Calif.), which went on to lose to Division I-A Dayton, 2-1, in the championship match. Against Coleville, senior Jordan Briggs led the offensive attack with 11 kills and four service aces to go along with her eight digs. Jamie Dodge finished the match with 26 assists and 11 digs, while Jillian Argiris tallied eight kills, Tilley Gibeaut had six kills and eight digs, and Rikki Partain had five kills. Partain, Dodge and Helana Kearns each recorded three aces. Sherene Clegg had two blocks. Against Sierra Lutheran, Briggs and Partain both finished in double-digits in kills — Brigs with 11 and Partain with 10. Partain also tallied six aces, while Dodge had 22 assists and four aces, Gibeaut had four kills, Clegg had three blocks, and Briggs had eight digs. Briggs carried her hot hand into the Lakers’ opening match of the tournament. She smashed 16 kills and recorded three aces and 12 digs to lead North Tahoe past Quincy. Dodge finished with 27 assists, Kearns posted 18 digs, and Partain had 10 digs, six kills and two aces. Stats were not available from the remaining tournament matches.